Learn about LA Yellow Cab. For years, Los Angeles Yellow Cab has been providing professional, friendly Santa Monica taxi service throughout the city. With fast pickup and delivery as well as courteous, professional service, our drivers will get you where you need to go safely and in no time at all. For even better service, try our user-friendly Curb app. This downloadable app allows you to order a cab any time you need one with one click. As a favorite Hollywood taxi company, we offer professional drivers who are licensed, certified and insured for your protection. Meeting the needs of our customers for West Hollywood taxi service is our most important goal! 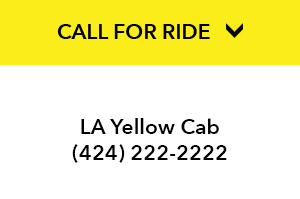 Let Los Angeles Yellow Cab take you wherever you need to go. Santa Monica has been a favorite beach resort for over a century, and today's visitors still enjoy a trip to the Santa Monica Pier, Third Street Promenade and Palisades Park. The annual Santa Monica Film Festival is just one of the numerous activities that have made the town famous. Whether you are a resident or a visitor from out of town, Santa Monica holds a unique charm that will have you returning again and again to enjoy the exciting events and see the beautiful sites. Calling Los Angeles Yellow Cab will get you there in style! For more than a century, Hollywood has symbolized all that is glamorous in the film and entertainment industries. While not every film company is located in Hollywood, the Walk of Fame featuring stars for important entertainers as well as the Hollywood sign have come to symbolize, for many, the entire entertainment industry. Visitors often want to see these sites as well as visit the various movie studios and other attractions along Hollywood Boulevard. Los Angeles Yellow Cab can take you in style to any location in Hollywood, whether you are touring or simply meeting friends. Call us for fast Hollywood transportation to all events and attractions! Located to the west of Hollywood proper, West Hollywood or WeHo is home to the famous Sunset Strip and borders both Fairfax and Beverly Hills. Full of shops and restaurants, it is a favorite place for tourists and locals alike to visit. While West Hollywood has been rated "the most walkable city in California" due to its incredible number of pedestrian-friendly streets, those visiting the area still need cab service to and from the city. If you are visiting West Hollywood, call Los Angeles Yellow Cab for fast and easy transportation to and from this thriving city! Why Choose Los Angeles Yellow Cab? By Phone. Los Angeles Yellow Cab offers fast, friendly phone service by calling (424) 222-2222. As always, our dispatchers will work to get you a cab as quickly as possible. By Website. When you visit the Los Angeles Yellow Cab website, you can choose from two ways to book your cab ride: download the Curb app or order your cab with the convenient online reservation form. With both methods, you can make advance reservations or order a cab for immediate pickup. 2017-2018 © LA Yellow Cab Co. All rights reserved.